Look back at your target savings for fertility treatments. Unless you’re already saving huge amounts of money every month, you need to start doing something different. You have 3 options for saving up this money: earn more, spend less, or do both. Personally, I recommend doing both. I can, and have, written entire blog posts on all of these options. I don’t want today’s post to be the length of a book, so I will limit myself to giving you just a few examples here, but please, get creative! The reason so many people fail to cut their spending is because they assume they will feel deprived. Instead, you should see it as the reward it is! Every $10, $20, and $100 you cut from your spending is money you’re putting towards your fertility treatments instead! Remember your priorities from Step #1? This is where they really come into play. Also, there are ways to cut expenses without feeling deprived. Right now, make a list of things you love to do that are free or inexpensive. These can include a lot of things you always wish you had more time for. Cut cable and watch Netflix. Skip the concert tickets and instead go to the free concert in the park. Instead of hitting the gym, hike that mountain you’ve been wanting to visit. Instead of shopping, take a bubble bath. 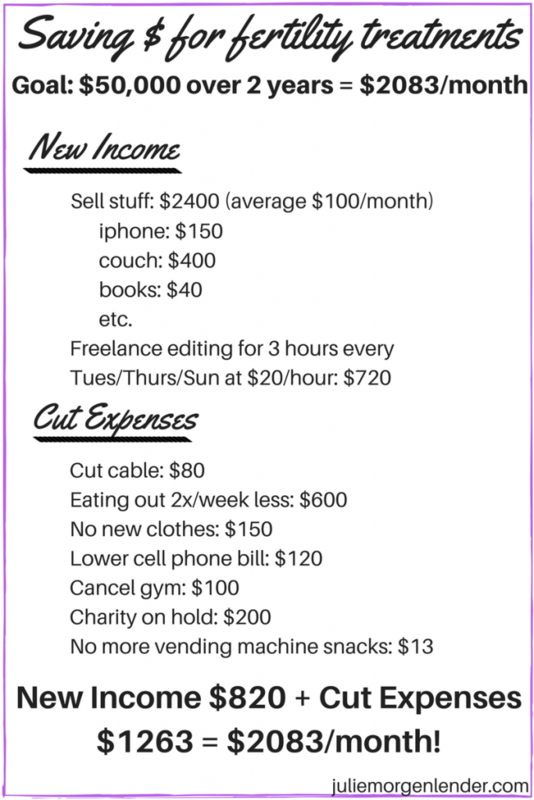 Now let’s talk about cutting (or reducing) expenses. Pull up your chart of expenses from Part 1. First, look for big one-time expenses you can cut. This might mean you cancel a vacation, sell your new SUV and instead buy a used sedan, or sell a vacation home. No ne of these things are easy, but they can have huge results, so you might decide they’re worth it. Would you rather drive a Corolla (my car, by the way) instead of a new Lexus SUV if it means you can afford fertility treatments? Only you can answer this. Next, look at your recurring expenses. These are the things that show up every month, like rent/mortgage, gym memberships, magazine subscriptions, and cell phone bills. Which of these can be cut? How about exercising outside or at home instead of at the gym? If you’re not reading that magazine, cancel the subscription. Consider switching to a cheaper cell phone bill. Attack every bill, because the more you save, the more you can put towards your fertility treatments. Now, for every category, return to Step #1 and ask yourself, “would I rather have this, or would I rather have fertility treatments?” Remember, it’s not all or none! You might cut an expense by 60% instead of cutting it out entirely. And there’s no “right” answer. Just be sure to look at every category – nothing is off limits! One of my clients saved $600 per year by finding his pet’s brand name medicine online. Look for as many substitutions as possible. If you like to go shopping when you’re stressed out, could you relax by reading a book at the park instead? Some of these expenses feel like big wins while others feel small. But let me assure you, the small ones add up big time! For example, if you eat out for lunch every weekday for a year and spend $20 (including tip) each time, that’s $5200 per year! What if instead you bring your lunch to work? You could save $100 per month by cutting your cable and that’s another $1200 towards your fertility treatments. Call all of your utility providers and negotiate lower rates, cancel subscriptions you aren’t using anymore, and take a few minutes once a week to plan out your meals so you can save money on food. Get creative and consider all of your options. And remember that this is temporary. Once the fertility treatments are paid for, you might return your expenses to their current levels. Or you might decide to level them out somewhere in between today’s spending your new spending, because you want to save more for kids’ clothes and college funds. The thing is, it will be your choice. Right now, you only need to focus on temporary changes to achieve your goal. Finally, be sure not to cut out all of your fun money. Every budget needs a “fun money” category whenever possible. Otherwise, you’re likely to burn out on saving and give in to temptations to splurge. A little fun money every month will keep you on the path to success. Simply choose an amount now, and stick to it. Income feels set to many of us. You earn what you earn at your job and that’s it. But you have options! Let’s start with one-time income. Selling stuff you have around your house is a great exercise. Not only will it bring in money, but it will free up space for the new baby (how is it that babies have so much stuff?!) Start with electronics. Old cell phones, even really old flip phones, can bring in decent money on sites like Craigslist and eBay. There are also a ton of great apps for selling your things like LetGo, Close5, and OfferUp (obviously, use your best judgment if you meet up with someone in person.) I was shocked to sell old (over a dozen years!) textbooks on Amazon. In 2016 alone I sold kitchen appliances, furniture, air conditioners, luggage, decorative items, dishes, board games, photo albums, and more, netting many hundreds of dollars. Imagine what you could earn by selling stuff you’re not using anyway! Take a few minutes right now to brainstorm other ways you could earn some one-time income. You might just be surprised how it adds up. Next, look for ways to bring in repeated income. This could mean asking your boss for a raise or taking on a part time job. You might line up gigs to pick up groceries for neighbors, walk dogs, or even dog sit for a week while people go on vacation. Consider ways to use your talents by knitting, tutoring, or fixing stuff for people. If you’re comfortable with it, you might rent out a room on AirBnb, run errands on TaskRabbit, or sell services on Fiverr. Thanks to the sharing economy, you have more options than ever! I just gave you a lot of ways to cut expenses and increase your income, but it’s not enough to say, “I’ll do a bunch of these.” Remember in Part 1 when I said that a lot of people fail with that approach? Well, I want you to SUCCEED! That means making a plan. Let’s say you need to save up $50,000. Write that at the top of a piece of paper as your goal. Now do the same for cutting expenses. Again, be specific! Plan to save money by eating out less by blocking out time every Sunday to do meal planning, buy groceries, and cook. Details are your friend! Now make adjustments. If you’re not even close to your goal, think bigger. What if you move? What if you get a second job? As you get close to your goal, make small tweaks. Always ask yourself if your plan is realistic. I can not stress enough how important that is. Once you have a plan that feels reasonable, print it out. Put a copy on your phone. Put it on your fridge, your bathroom mirror, your computer screen. Remind yourself every single day why you’re doing this. This is hard. Going through fertility treatments is hard enough, and now you’re adding money concerns on top of it. Money is emotional all on its own. It’s ok to feel frustrated and discouraged. Let yourself feel those negative emotions, experience them, then remind yourself of your end goal and that this is only temporary. Create 2-4 new goals to focus on right away. These might be buying a crib and other baby gear, going on a babymoon, buying a family car, paying off the rest of your debt, funding your retirement, or anything else you can think of. Funnel the extra savings you now have each month towards your new goals. Now that you have experienced intense savings, you know what’s possible. This is the gift that keeps on giving, because it means you can live the rest of your life without debt and with plenty of savings. That’s a fantastic gift that you can be proud to pass on to the next generation. To get a FREE downloadable PDF of this post that you can save or print to reference any time you want, visit Nest Egg Chick’s page created just for readers of this post here. Julie Morgenlender is a Financial Freedom Coach, working with women to end their money stress and become money-EMPOWERED instead. She works with women to pay off debt, build up savings, take control of their money, and fund their dreams. She blogs at juliemorgenlender.com and runs the Nest Egg Chick Facebook group. She also enjoys knitting, crochet, reading just about any genre of book, writing a book of her own, and cuddling with all of the neighbourhood dogs. Because dogs!